The Electronic Educational Environment (EEE) course management system has added a new way for instructors, TAs, and students to view their classes on MyEEE. 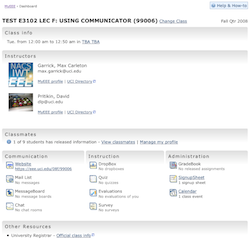 The new ‘Dashboard’ view consolidates all information for a single class on a dedicated page with class announcements, instructor and TA photos (if provided), links to class resources, and more. In collaboration with the UCI Libraries, the EEE Web Team has added a new option to embed the ‘Ask a Librarian’ chat services directly on MyEEE. Students, instructors, and assistants who add the module to their MyEEE homepages can have real-time inline chat sessions with reference staff from various academic libraries. In October, OIT launched ‘Replay,’ a service for recording and distributing audio and/or video of lecture classes. Now, EEE has added a new tool, ‘Podcasts,’ to make it easier than ever for instructors and TAs to provide recordings to their students. 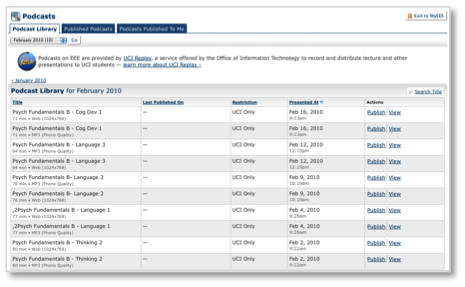 EEE Podcasts allows instructors and TAs who have used UCI Replay to link their Replay recordings directly to their classes on EEE. Students will have a convenient ‘Podcasts’ link on their MyEEE pages to help them find their class content. Blogs@UCI is a new blog service for UC Irvine. It allows you to create a blog quickly and start posting news, video, audio or anything you want to share with the world. (Blogs, short for weblogs, are online journals.) Blogs@UCI is built on WordPressMU, a multi-user version of WordPress. WordPress is an open-source blog publishing application. It is also the application used for publishing IT News, so if you’re reading this article, you’re probably already familiar with WordPress. Currently, faculty, staff and graduate students can create blogs using this service. Undergraduate students who are collaborating with faculty or staff can participate in blogging by being given access by their faculty or staff sponsor. Blogs@UCI is similar to commercial blogging services like Blogger, LiveJournal, and WordPress.com. All have a simple and easy to use interface for updating blogs. We are ad-free and the entries can easily be exported and backed up in an open format. There’s also the added benefit of having the UCI branding and domain for your blog address. Blogs@UCI uses UCInetIDs to authenticate, so creation, access, and privacy are all managed in terms of existing UCI electronic identities. If you would like to establish a group, or shared blog, you may create a new blog and add UCI users. The other members of your blog will need to have a UCI.edu email address and a UCInetID. Before starting a blog, it is worth noting the very nature of blogging is to share information with the world. When you publish an entry on your Blogs@UCI weblog, you are essentially posting on a public website. Anyone who knows the address of your website can see it and share the link with others. If you want to blog and keep your identity private, consider a commercial service like Blogger, LiveJournal or WordPress.com. There is an option within Blogs@UCI to create “private” posts which require a password. You may also block search engines from finding your blog. By default, we have comment moderation turned on. That means that comments to your blog are held for your approval before becoming public. We have also installed Akismet Spam protection which does a good job of filtering out spam. You can learn more about Blogs@UCI in our online FAQ . The EEE Web Team has added a new feature to EEE Survey and Quiz, custom email reminders, which can be scheduled by administrators. Any identified participant who has not completed the survey or quiz by the selected date and time will be sent a copy of the email. Participants who have already submitted the survey or quiz will not be sent reminders, so administrators can schedule as many emails as needed without filling the inbox of those who have already participated.